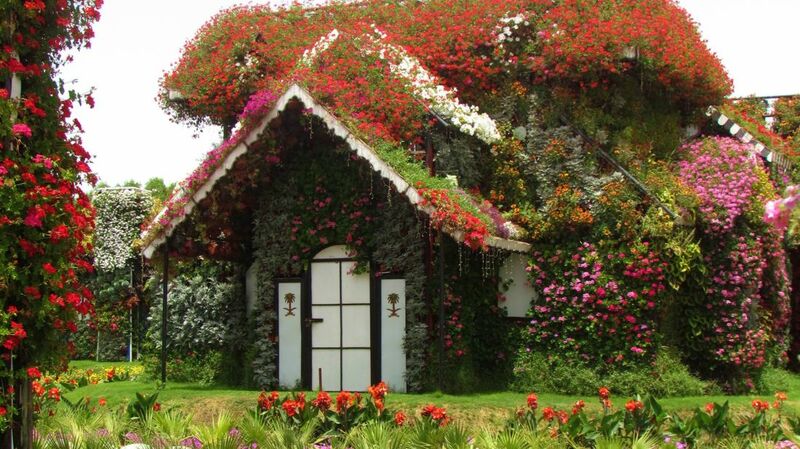 The world’s largest flower garden exists in a place you might not expect. It’s found not in the lush Tuileries of Paris or the Renaissance-era terraces at Villa d’Este in Tivoli, Italy, but in the desert outside Dubai, United Arab Emirates. Opened on Valentine’s Day 2013, the Dubai Miracle Garden is the world leader when it comes to enormous flower gardens, comprising 150 million individual flowers and blowing its nearest competitor, the tulip-based Keukenhof in the Netherlands and its 7 million blooms, out of the water. It's an entire theme park devoted to flowers, featuring peacocks, castles, windmills, houses, cars, a giant woman, and a replica of the world’s tallest building, the Burj Khalifa, all made out of flowers. You even have to walk through a huge (fake) flower to get inside. At close to 2 million square feet, the complex also includes retail stores, a mosque, a floral clock, and the region’s first butterfly garden. Being inside is a charming flavor of bizarre, like strolling through a Lewis Carroll book or a flower world in Super Mario Bros., if such things existed. Rainbow blossoms dazzle the eyes in every direction. Some of the more surreal displays include an upside-down flower house and a giant faucet (not made of flowers) suspended in mid-air, pouring water into a small lake. Romance also seems to be a major theme at the park—in keeping with its opening date—with heart-shaped archways and swans perched throughout. Not surprisingly, it’s a popular spot for wedding-related photo shoots. The bulk of the floral displays stay the same year after year, although each fall—after the garden closes for the blistering hot Arabian summer—a handful of exhibits change. The park currently includes at least 45 different species of flower imported from around the globe, many of which are difficult to cultivate in the desert and rarely seen in the Middle East, such as geraniums, marigolds, calendulas, and petunias. In addition to being the world’s largest garden in terms of flower count, the Dubai Miracle Garden also holds the current Guinness record for largest flower arrangement. That award was bestowed in December 2016 for a floral structure in the shape of an Airbus A380 that’s 230 feet long and includes more than 500,000 fresh flowers and plants, constructed over a frame built from recycled materials. Considering its location on the arid Arabian Peninsula, this is probably the cleverest—and possibly the only—way to make such a massive, fantastic oasis bloom in a place where water is in very short supply. And that is indeed miraculous. All photos by Stephen Allan unless otherwise noted.